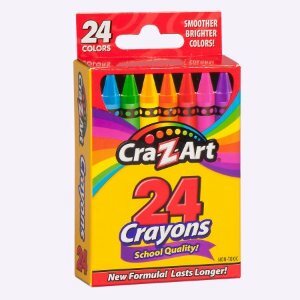 Walmart offers the Cra-Z-Art School Quality Crayons, Smoother and Brighter - 24 Count for $0.25. Features：Cra-Z-Art's 24 count crayon box has 24 different colors for endless creativity The crayons are smoother and brighter. The box has a perforated top for easy access to all of the colors. The crayons are school quality and non toxic.